The rear panel provides locking connectors for the input and output power. Multipleinput and output power panel options are available. A removable and washable intake air filter and highcapacity stainless steel ball bearing fan provide added protection in both controlled and hostileenvironments. The air is drawn from the rear and exhaust air is diverted out the front vent, with alternateair flow directions optional. The external battery connector allows the safe and easy addition ofextra battery modules without having to shut the unit down.The batteries are maintenance free with immobilized electrolyte and areconstructed of flame retardant materials. For more information, see the BatteryTechnology section. 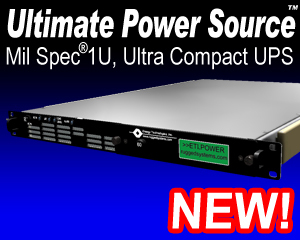 Theunit also operates as a frequency converter, taking 46-440 hertz input andconverting it to 60 hertz power. A frequency selection switchis available for those sites requiring 50 hertz output instead of the standard 60 hertz. The Status connector provides an interface withoptional computer software providing loss of AC and low battery status as well as remote shut downcapability.